I'm receiving this error when trying to submit payment through my form. 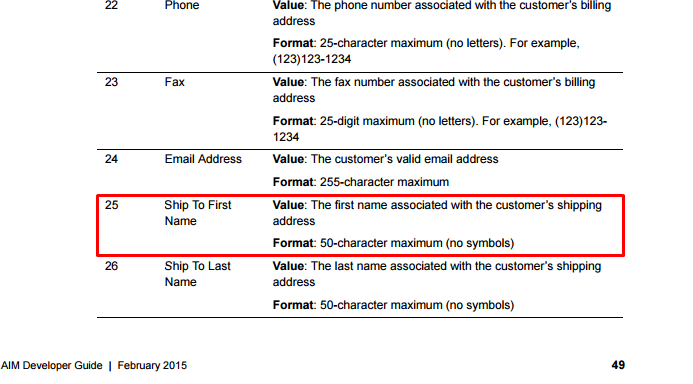 "Error during transaction Ship To First Name is required." My first name field is not required and there is no shipping. Does anyone have a solution for this?? See attached screenshot of the error and form url. 1. Log in to your Authorize.net account. 3. Click on Payment Form under the Transaction Submission Settings section. 4. Click on Form Fields. Look for the Shipping section and deselect the Required Column for all Shipping Information setting.